Friday prayers at the newly opened Islamic Center of Murfreesboro in Murfreesboro, Tenn., on Aug. 10. The center was the subject of protests and court action by groups opposed to the mosque since construction began two years ago. The mosque opened in the final days of the Islamic holy month of Ramadan. On Sunday and Monday, when Muslims will celebrate the end of Ramadan, even many who are less observant the rest of the year will be at mosques to pray. But many worshippers will celebrate amid heightened security after a recent spike in attacks on mosques and other places of worship. 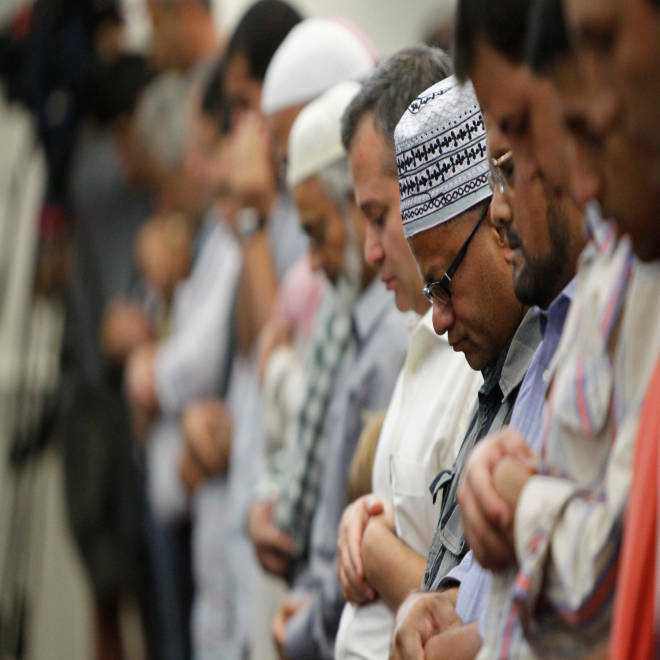 "We recommend a security guard during prayer hours,” said Abed Ayoub, legal director of the nonprofit American-Arab Anti-Discrimination Committee, or ADC. "Take measures and use common sense. Keep an eye on people who don’t seem to fit in. We ask them to install video cameras at the doors and throughout the mosque. Limit access to areas such as the kitchen, furnace or storage where someone could hide." This is not the first time that Muslims have been advised to exercise caution. There was a spike in crimes aimed at the religious minority after the Sept. 11, 2001, attacks on the United States by Islamist terrorists, and Ayoub said there has been an increase again since 2010, starting around the time of the bitter dispute over Park 51, the so-called "Ground Zero Mosque" in Manhattan. The latest round of cautionary alerts was set off by the bloody attack on a different religious group. On Aug. 5, six Sikh worshippers were killed and others wounded when Wade Michael Page opened fire at their temple in Oak Creek, Wis., before killing himself. Because the suspect is dead, his motives remain unknown. But he had white supremacist connections, so many observers concluded that his attack was a hate crime targeting strangers who were minorities. "What happened in Wisconsin was a tragedy, and it shed light on the bigotry that unfortunately still exists in this country,” said Ayoub. Muslim groups expressed solidarity with the Sikh community, and fears of their own. "Within an hour of the Sikh shooting we were on the phone with the Dearborn metro law enforcement, and beefed up security that evening," said Ayoub, who is the legal director for the Washington-based ADC. The group has offices in Dearborn, Mich., which is home to the largest concentration of Arab Americans in the country. In the 12 days since that deadly shooting, at least eight cases of vandalism and attacks on mosques, including a suspected arson, have been documented by the ADC and other civil rights groups. Investigators have not been able to prove a fire that destroyed a mosque in Joplin, Mo., on Aug. 6 was intentionally set, the FBI said on Thursday, but they have video surveillance of an apparent arson attempt at the mosque one week earlier and have described the second fire as "suspicious." In Morton Grove, Ill. while 500 were attending evening prayers at a mosque in the Chicago suburb, a man shot at the building with a pellet gun, only slightly damaging the building, but nearly hitting a security guard. The man arrested in connection with the incident turned out to be a neighbor who had a history of complaints and opposition to the mosque, said Rizwan Kadir, who is on the board of the mosque and school. In Oklahoma City, vandals defaced the Grand Mosque, firing paintball guns at it while it was filled with worshippers. In Lombard, Ill., a "MacGyver bomb" hit the window of an Islamic school that was being used for evening prayer. The soda bottle, filled with chemicals and aluminum foil that react to make an explosion, did not break the window and exploded outside, so worshippers were rattled but not hurt. In Hayward, Calif., four teenagers were arrested after vandalizing a mosque by throwing lemons, oranges, eggs, and firing BB guns. "If you look at the smaller incidents in isolation you can deal with it, but when you see all these things happening, it does take its emotional toll on people,” said Kadir. Kadir said many people in the area, local Christian and Jewish groups, as well as the police and Morton Grove mayor and trustees have come forward to show solidarity with the Muslim community since the shooting. "All these are positive things," he said. "At the same time we are on our guard." While no one is saying that the attacks are connected, many Muslim leaders and civil rights advocates see common fuel in the anti-Muslim rhetoric that they say has intensified during the current election cycle. "When the rhetoric gets bad, the hate crimes and attacks go up,” said Ayoub, of ADC. "Unless the rhetoric changes, I feel there will be more happening before the election. On the list of politicians he says are fueling bigotry is Michele Bachmann, who recently led the call for a federal investigation of senior State Deparatment official Huma Abedin. Bachmann accused Abedin of using her position to influence policy in favor of Egypt’s Islamist Muslim Brotherhood. The charge outraged many Muslims. Even some of Bachman’s fellow Republicans protested the attack, including Sen. John McCain, who defended Abedin as a "true patriot." Another politician becoming well known for his persistent warnings about the threat of "homegrown radicals" among the Muslim population is Rep. Joe Walsh, R-Ill., a member of the House Homeland Security Committee. "While the overwhelming majority of Muslims are as peace loving as everyone else, there are radical Islamists right here in the United States trying to kill Americans and destroy this country," he told a town hall meeting in Elk Grove Village, Ill. The ADC draws a direct line between Walsh's comments and the "MacGyver bomb" attack on the worshippers in his district, saying his comments incited fear. In a statement on Wednesday, the group called on "all politicians and elected officials to change the national discourse, distance themselves from xenophobic rhetoric and put an immediate end to the culture of hate and violence." Walsh's office rejected the idea that the congressman's statements incite or condone violence against ordinary Muslims. Walsh was merely restating what has been said in a series of committee hearings on homegrown radicalization of Muslims, according to spokesman Justin Roth. "Not one time has Congressman Walsh said that we need to go get those Muslims," said Roth. "He condemns these attacks just as he condemns the more than 1,000 attacks against Jews every year (that take place) simply out of hatred." Ayoub and others urged Muslims to reach out to police in their areas seeking additional patrols and support, especially for crowded Eid al Fitre prayers on Sunday and Monday. "It's very important to keep everybody calm, don't let your people be afraid," said Ayoub. "We don't want people not going to the mosque because they are afraid. We want to ensure that people go and leave safely."